Place Font Awesome icons just about anywhere with the <i></i> tag. To increase the size of icons relative to its container, use fa-lg (33% increase), fa-2x, fa-3x, fa-4x or fa-5x. Use the fa-spin class to get any icon to rotate. Works best with fa-spinner, fa-refresh and fa-cog. CSS3 animations aren't supported in IE7 – IE9. Have you started using using Quark for any of your projects? Shoot me an email as I'd love to hear how you've used it. If you're having any issues with using this theme you can post a question on the official WordPress support forum and I'll do my very best to help you out. Don't forget to also check out the Frequently Asked Questions on this site as you'll find heaps of tips and useful snippets for use with Quark. 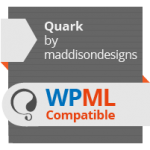 Creating and running a multilingual site is even easier now as Quark is Multilingual Ready using the awesome WordPress Multilingual Plugin (WPML).